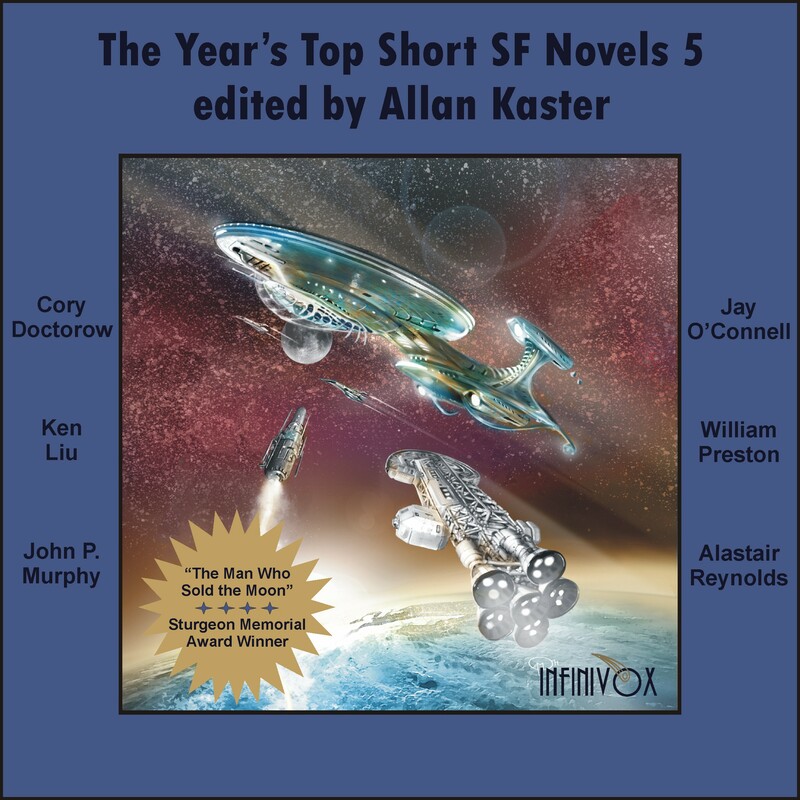 The Year's Top Short SF Novels 5 is also available as an e-book for $5.99 on the Kindle here and the Nook here and for iBooks through iTunes. Short novels are movie length narratives that may well be the perfect length for science fiction stories. This audio collection presents the best-of-the-best short science fiction novels published in 2014 by current and emerging masters of this vibrant form of story-telling. In “The Man Who Sold the Moon,” by Cory Doctorow, hardware geeks and Burning Man fanatics band together to overcome challenges such as crowdfunding a space mission, falling in love, battling cancer and perfecting an open source engineering marvel in order to put a 3D printing robot, that creates ceramic building panels from sand, on the moon. “The Man Who Sold the Moon” won the 2015 Theodore Sturgeon Memorial Award for best short science fiction. In “The Regular,” by Ken Liu, a cybernetically enhanced private investigator keeps her emotions in check with a piece of hardware called The Regulator while she searches for the murderer of a prostitute whom she suspects is a serial killer. “Claudius Rex,” by John P. Murphy, is a sci-fi whodunit comedy that pays tongue-in-cheek homage to Rex Stout and Isaac Asimov. A humble PI partners with an arrogant AI to solve the murder of the AI’s creator. Ai! In “Of All Possible Worlds,” by Jay O’Connell, an old timeline wizard coaxes a younger man to become his apprentice in an attempt to edit Earth’s history so that the planet will escape the ravages of the Long Night and ensure that our timeline is the best of all possible worlds. In “Each in His Prison, Thinking of the Key,” by William Preston, the U.S. government brings a telepathic interrogator, who is a veteran of the American war in Iraq, to a secret complex in Texas to get a handle on an enigmatic prisoner known as “The Old Man.” A test of wills ensues between the two in this homage to Doc Savage. Finally, in “The Last Log of the Lachrimosa,” by Alastair Reynolds, set in the Revelation Space universe, a crew investigates a cave on a volcanic planet in the hopes of salvaging valuable abandoned tech only to discover that the cave is defended by a horrific psychological weapon.